Of all the Battlestar Galactica characters, it might seem like Lee "Apollo" Adama lost the most in the "Daybreak" episodes. Lee lost his dad after he flew around the world to show the dying Laura Roslin, in her final moments, how much life existed on their new planet. He lost his friend and on-again-off-again love interest, Kara Thrace, after she vaporized into thin air, having fulfilled her mission to lead humanity to a survivable planet. By some accounts, Lee Adama's fate could be classified as a tragedy. Jamie Bamber doesn't see it that way. We chatted with Bamber about the final installments of the timeless show, why he's a huge fan of the ending, the peace he finds in Lee's final moments and whether he thinks a reboot of the show could be possible. 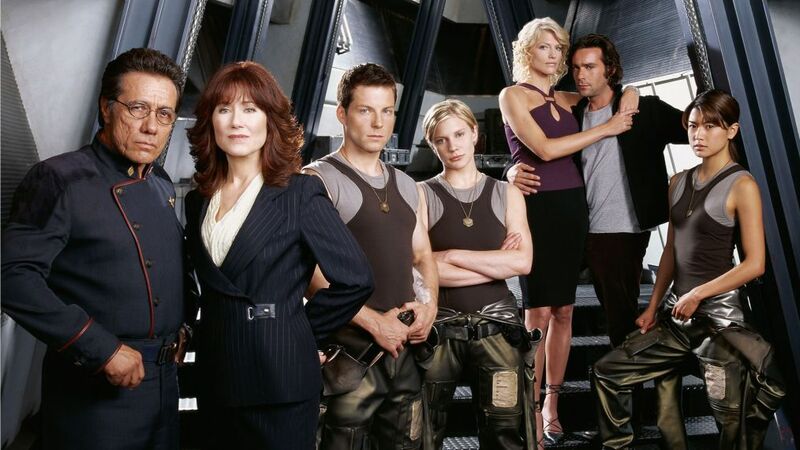 March 20 will be 10 years since Battlestar’s final episode aired on Syfy. Have you watched, or re-watched, the finale since then? Jamie Bamber: No, I haven’t. But I’ve got loads of stuff in storage here in London from a home we used to own in LA — useless things, like pool furniture, I’ll never own a pool ever again — but I did dig out boxes of unopened DVDs so I can re-watch with my girls, who are now plenty old enough. So yeah, I’m really contemplating it this time. I’ve said that over the years a few times, but I’ve finally got my hands on the hardware, and as soon as I get a moment, we’ll see! Were you happy with the way it ended? I remember being absolutely delighted. The thing that I loved the most was doing the flashbacks. There’s a trope within the show that “all of this has happened before and all of it will happen again,” that J.M. Barrie circularity thing, and I thought the way Ron [Moore] used that to structure the final two episodes was just awesome. It was overtly emotional, revisiting these characters and taking them back to before we’d even met them and having them all say their very tearful farewells to each other. We were all so emotionally involved with it, with each other, with the five years we spent together. I think the experience was profoundly moving and it felt as momentous as it could be. I was a huge fan of the final two episodes. Since you mentioned the flashbacks, I wanted to talk a little about Kara and Lee. Some fans were rooting for them — with those flashbacks in the last couple episodes, do you think there was an element of fate to their connection? What’s your opinion on their relationship? It was a cursed relationship, essentially. It’s in the great tradition of star crossed lovers that can’t be together. It was Ron Moore’s version of that. It was almost incestuous — a “brother and a sister” relationship that couldn’t be allowed to continue, but yet there was a real pull there — and as a result it was never a dull coupling. There was so much at stake, so many different layers of tension, and as an actor, endlessly playable. Ron brought a whole new dimension to the finale, making it almost metaphysical. I love that about Ron’s writing — he’s not scared to take something that’s definitely working, that everyone loves, and really throwing everyone for a loop by taking it to a dimension that not everyone believes in. I thought it was cool. One of the things that always surprises me when I rewatch the finale is that the Adama family sort of splits up, seemingly for good, in that last episode. Do you think that was the last time Lee saw his dad? I never really thought about it, to be honest. Like all good endings, I think you sort of leave it at the end. What was the family is in different physical locations at the end there. They’re still on the same planet, they’re still emotionally connected. If there’s anything to learn from the Kara-Lee thing and the Kara “death” and her remaining in the bosom of the fleet after her death, it’s that it takes a lot to separate people or families that are connected and have deep relationships. Distance doesn’t separate them, death doesn’t even separate them. It’s almost irrelevant to ask whether they’ll see each other again, since they’re definitely reunited in their relationship with each other. They definitely have reached a point of arrival, and whether they see each other again doesn’t really matter because they’ve been reunited emotionally and their connection is alive. To me Lee’s ending is one of the more bittersweet, since he lost both his dad and Kara. Do you have any thoughts on what happened to him in the end? I don’t remember it being bittersweet; they’ve all arrived at this place of rest, and for Lee, he had a slightly overly simplistic view of the world, which was “technology got us into all this mess, let’s just get rid of it.” And sure enough, that’s where he is — he’s on a beautiful, green, unspoiled planet. Technology hasn’t cast its shadow there yet. I think there’s a bittersweetness to realizing Kara’s gone and yet she’ll remain with him, and all these people who meant so much to each other are going to embark on a different journey and civilization is going to start again. For Lee, at that final moment, I think it was just rest. It was relief. They’ve arrived at an oasis, and I think if anything, he’s learned — like we all try to learn, these days — just breathe. Live in the now. Accept that this is where you belong, and this is where you were meant to end up, and I think there’s peace in that. Every time I re-watch the finale, I’m surprised that Lee’s the one who suggests letting go of all technology… but then I think about the perils of technology today, and I get it. Did you understand Lee’s choice? I totally understood it. Again, the wonderful thing about working with writers who are your friends and collaborators over five years is that the lines between character and actor become blurred. I think Ron picked up on something that I feel. I don’t think technology’s always a solution, and that’s what the whole story of Battlestar’s about. It’s about us not really, truly being responsible for our own creations and our lack of reflection before we embark on something, and the consequences that can have. I was delighted, when I read that. I thought it was really cool. I thought [Lee] was someone who was yearning for simplicity and not trying to overcomplicate things. As I’m sure you know, Battlestar Galactica has a powerful legacy in the sci-fi world. Why do you think it’s remained relevant over the years? Because it’s a creation story. It’s elemental, it’s fundamental. When it comes right down to it, it’s an epic. It’s biblical. It’s a creation story of civilization’s genesis, and along the way, it deals with all the fundamental problems of being a human and does so in a context that I think will always be relatable. Ron, at the heart of his vision, did not confuse the palate with overelaborate conceptions of what civilization could look like, what organics could look like. It was meant to feel immediate, it was meant to be unfussy, the shooting style was meant to be direct, and I think it packs a punch as a result. In this era of revivals and show continuations, could you see a reboot happening? Would you want to be part of it, if it did? Look. The entertainment industry is all about who owns the rights to what, and from that perspective, no, I can’t see it happening. Certainly not with us. Various people have tried with movie versions, but they’ve all sort of hearkened back to the original. I don’t think they’d revisit what we did. To answer the second part of your question, it was the single most rewarding experience of my life and I worked with people who have taught me so much and given me belief in myself. I got married, had three kids. My life completely changed. To say that I’m not nostalgic about that, that I wouldn’t in some ideal universe wish to be reunited with all my colleagues again and do something — it would be wonderful. But can I see it happening? No, I can’t at all. Are you still in touch with your Battlestar co-stars? Yeah, literally all of them! We’re all great friends. I don’t live in LA anymore, I moved away to Europe a few years back, so I see them much less than I used to. My home in LA at the time was sort of like the BSG brig; people were coming through from Vancouver or from the other side of the world found themselves “incarcerated” on a regular basis. People rented the house from me. Kandyse [McClure], too, shared the place, Aaron Douglass… literally everyone has been and stayed at our place in LA. James [Callis] is from London as well, so I see him more often than I see anybody else. But we’re all dear friends, we’re all in touch on email and phone calls. Michael Trucco, Tricia [Helfer], Katee [Sackhoff], the whole shebang. We’re very, very close. Occasionally we all get together at an event or something like that, and it’s a joy every time that happens. But no, I never worry about losing touch with any of them. What are you up to now, in 2019? I am involved in a project called Strike Back — it’s on Cinemax in the US — playing a colonel in a very covert section of the British Special Forces. We essentially go around saving the world but nobody realizes, except that we leave a big body count and blow a lot of stuff up. It’s very fun to do. That is what I was shooting all of last year, and I’m about to do another season of that in Croatia.